We got together yesterday at the headquarters of Nothing Interactive for the inaugural School of Data arts (SoDa) workshop. Many thanks to the participants for coming out / dialing in on a rainy Friday to buckle down and launch the first in a series of data expeditions. In the morning we got to know each other, discussed ideas and datasets, looked at a bunch of inspiring links. You'll find a glimpse of this in the gallery and links log. This was a first in-person working session to flesh out the ideas we've been circulating for months around the launching of a data literacy initiative. We then got on with beta testing the concept. 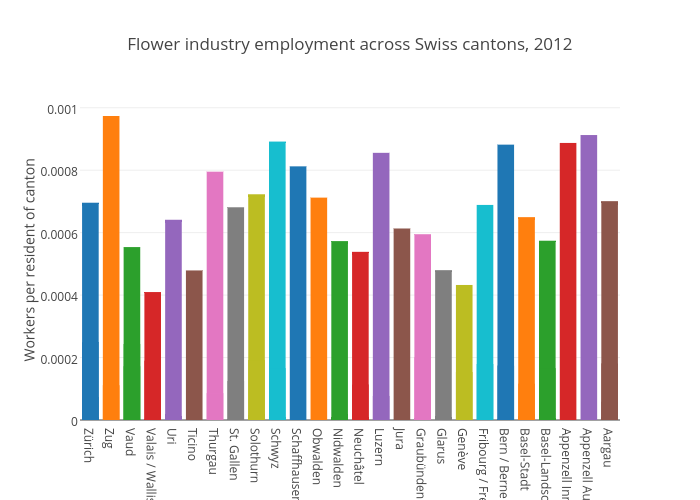 Along the way we learned how to use a spreadsheet as a simple database, cleaned up and reorganised tabular data, read into the nuances of data publishing standards, and used simple statistics to create an interesting conclusion: there are almost twice as many people per capita working in flowers in the small cantons of Schwyz and Zug, as in the larger cantons of Geneva and Wallis. With more detailed data we might ask what impact mountainous geography has on flower growers, or if there are sociopolitical factors correlating with the preponderance of flower-related services. We parted in the afternoon leaving the task to animate this graph and adding blooms for homework. More detailed tutorials along the lines of what we were working on could be found on the School of Data blog, e.g. UK and US video game magazines. We are now collecting links and ideas and developing web resources to serve as wayposts to learning. Next workshop will be at the Open Research Hackdays in Lausanne. To everyone helping us to launch and participating in these first get togethers! Kudos to Nothing for hosting our bodies and to Linode our code. Stay tuned: we are now on Twitter Facebook and GitHub, have an open Trello and mailing list, and are starting a weekly Hangout planned Fridays at 15:30 - 15:55.